Yacouba Jacob Bogre, far left, and Rev. Debbie Ingram, far right, stand with supporters of Syrian refugees at a press conference Thursday. 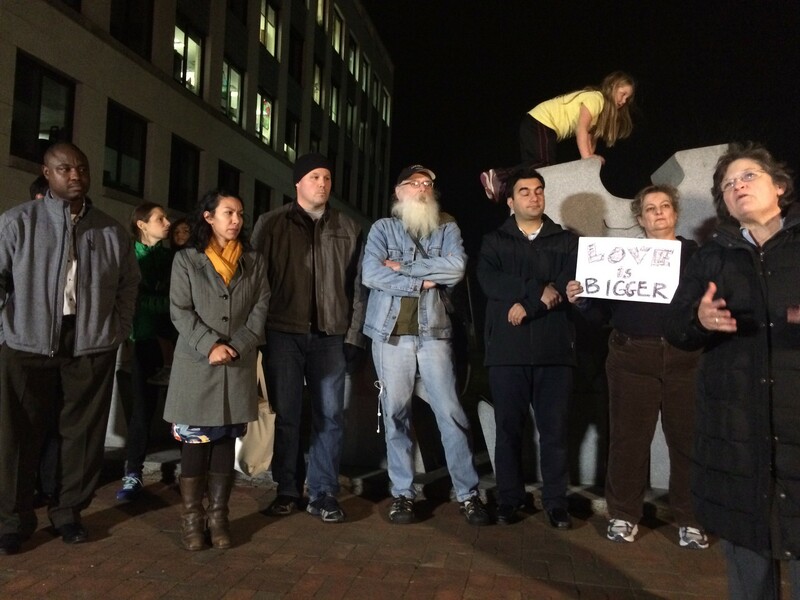 In front of a sculpture with granite jigsaw pieces spelling out “Democracy” on Burlington’s Main Street, a group of activists began a counteroffensive Thursday evening against calls to stop Syrian refugees from entering the United States. Rev. Debbie Ingram, executive director of Vermont Interfaith Action, credited Gov. Peter Shumlin for taking the “courageous and compassionate” stance that Vermont should welcome refugees from the war-torn country. “Also,” she continued, “we have come to speak out against those in Vermont who would not applaud and support Governor Shumlin’s decision." In the wake of the terror attacks that killed 129 people in Paris, both Republican candidates for governor have said Vermont should temporarily refrain from accepting Syrian refugees until the federal government can prove the rigor of its vetting process. Nationwide, at least 28 governors have made similar calls, and on Thursday, the U.S. House passed a tougher screening process for Syrian refugees. The White House has said President Obama will veto it if the Senate follows suit. A Syrian passport found after the attacks ignited concerns about refugee screening. Vermont doesn't currently have any Syrian refugees, but officials expect some will arrive during the coming year. Before the event, Amila Merdzanovic, field office director for the Vermont Refugee Resettlement Program, told reporters that it typically takes 1,000 days for the United States to process a refugee. Her point: The process is already plenty rigorous. “I keep saying this. I’ve said it more times than you can imagine," said Merdzanovic, who came to Vermont in 1995 as a refugee from Bosnia and Herzegovina. The organizers of Thursday's press conference are also planning rallies today and Saturday on the Statehouse lawn in response to a rally against accepting Syrian refugees.